A new report by Michael Schoeppner (PDF file) assesses how the radioactive noble gas krypton-85 in the atmosphere could be used for monitoring the covert reprocessing of spent nuclear fuel to separate out plutonium for a nuclear weapon program. Krypton-85 is a fission product and is released when spent fuel is being reprocessed. Case studies of the reprocessing plants at Dimona in Israel and at Yongbyon in North Korea show that for either of these sites two or three down-wind krypton-85 monitoring stations located in the most frequent wind directions would be sufficient to monitor and verify a shutdown of reprocessing activities. It appears on the order of 50 random air samples taken over an area of 10 million square kilometers (roughly the size of the China or the United States) could detect significant clandestine reprocessing activities within the time it takes to separate a quantity of plutonium considered sufficient by the International Atomic Energy Agency to build a first generation nuclear weapon. The krypton-85 releases from a small scale facility would be hard to detect because of the accumulated atmospheric background due to large scale reprocessing for military and civilian purposes in a handful of countries around the world and local fluctuations due to on-going reprocessing. Reducing the krypton-85 background in the atmosphere by ending civilian reprocessing would dramatically improve the effectiveness of detection of clandestine reprocessing. 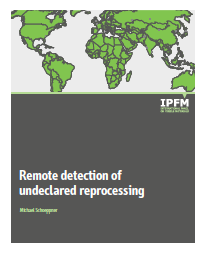 The report concludes that ending reprocessing for any purpose should therefore be seen as a step towards improving global nonproliferation, arms control and disarmament verification. Michael Schoeppner is a researcher at the Institute of Safety/Security and Risk Sciences in Vienna, and was a post-doctoral researcher at Princeton University's Program on Science and Global Security.